The curtain may be falling on Downton Abbey but Highclere Castle, the stately home where the series is set, carries on its grand march through history undaunted. The stellar cast members that have appeared throughout the series, including Dame Maggie Smith, Hugh Bonneville and Penelope Wilton to mention just three, obviously attracted huge acclaim, but equally one of the most important features of the script was the stately home itself. 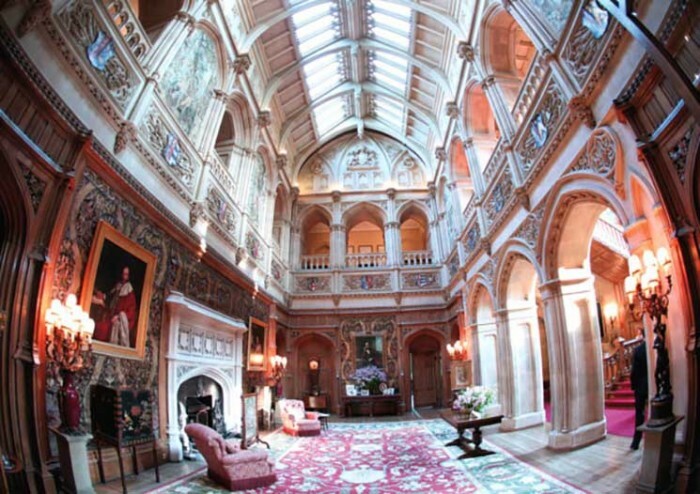 Highclere Castle, near Newbury, on the Berkshire-Hampshire border, is the eponymous Downton Abbey. Home to the Earl and Countess of Carnarvon and their family since 1679, Highclere is undoubtedly one of England’s most beautiful castles set amid spectacular parkland. The current castle was largely rebuilt in the mid-19th century by Sir Charles Barry, the architect who redesigned the Houses of Parliament. The majestic Victorian gothic edifice, standing in grounds landscaped by Capability Brown, is a testament to Britain’s pride and self-confidence of the time. Downton Abbey’s creator, the Oscar-winning script writer Julian Fellowes, fell in love with the castle many years ago. He is a personal friend of the Carnarvons and longed to set a drama at Highclere from his first visit, wanting it to be the backdrop for his screen version of Little Lord Fauntleroy in the 90s. Nevertheless, Highclere remained close to his heart and when the idea for Downton Abbey emerged, the castle was top of Julian’s location wish list. Yet despite visiting the stately home first, producer Gareth Neame of Carnival, together with his production team, spent six months scouting for other houses. None, however, compared with the original venue. “Finding the hero location was a funny journey because from day one Julian said the house he had in mind was Highclere. When the show was greenlit I came down to have a look around,” recalls Gareth. “Initially, it seemed wrong to just tick the box without exploring other options because it was such a key factor in the show and probably the singular most important character. It was always the plan to film the state rooms and public rooms on location at Highclere, but finding the servants’ quarters, kitchen and bedrooms almost unaltered since the Edwardian period was a real bonus.